I include the definition of spelunking here, not because I assume you don't know what it means, but because I assume your high school didn't have a Spelunking Club, which met monthly and got you out of homeroom but never actually set foot in a cave, which is how I learned the word. If you weren't exposed to the wonderful world of pretending to be interested in exploring caves (cave motto: We're the nostrils of the Earth!) in order to avoid homeroom, I can't imagine where else you might have heard the word "spelunking," especially when most people just call it "caving." But "spelunking," as a word, is clinically proven to be 74% funnier than "caving," which is why I chose it for the title. Plus, I like to think of the new Google search traffic it will bring from all those spelunkers sitting at home wearing their hard hats with lights on top, trying to buy some canned bat repellent or find photos of stalagmites, who'll end up here. Won't they be confused when they accidentally read a bunch of junk about baby fingernails instead! Which brings me to the point of this post - baby fingernails. There are three main facts about baby fingernails that every parent knows. Baby fingernails are the sharpest material known to man. They're used in the lumber industry for felling Giant Sequoias. Jewelers use them to cut diamonds. Certain Ancient Ninjas used them as weapons until baby fingernails were banned for giving them an unfair advantage, and they had to resort to using throwing stars. True story (not really). Baby fingernails are nearly impossible to cut, because babies' fingers are so busy being inserted into noses and electrical outlets or picking up things off the ground that could potentially be delicious. Babies have no patience for the clippers, and the clippers (while not as sharp as fingernails) are pretty sharp in their own right, and not to be used on a moving target. So what's a parent to do? You can't just ignore the problem, or you'll end up with a baby crawling around with fierce little Weed Eaters for hands, tearing up your carpet and turning your furniture into topiary sculptures, not to mention scratching themselves and shredding up all their stuffed toys. No, the solution is to sneak up on them while they're sleeping. But what if your baby is spoiled particular a light sleeper, and you can't turn on the light for fear of waking them up and spending another two hours getting them back to sleep? Well, that's when this happens. This is a photo of my husband wearing a spelunking headlamp so he can stealthily clip our daughter's fingernails in the dark. It made me laugh so hard I almost rolled off the couch, and I probably would have if I hadn't been holding the baby at the time (I try not to fall on the floor while I'm holding her, as a general rule - yes, I'm ready for my Mother of the Year nomination). So I'm sharing this pic for March Photo Challenge 19 prompt: Funny. Because it was. At least from where I was sitting. Please click the banner below to vote for me, because hey, when was the last time you read a post that combined caving, fingernails, AND ninjas? I'm guessing it's been a while. Linked up with Finding the Funny #17! This photo is proof positive that your marriage is truely a match made in heaven. I can only imagine the conversation as this plan was hatched. Tell me, did he rob Chatty Cathy for the batteries for the lamp? I think part of why this struck me as so funny was that there wasn't any conversation leading up to it - he just walked into the room with that light on his head, acting like it was the most natural thing in the world. Which I agree, makes us a match made in heaven. That's DOCTOR Fingernail Spelunker McCaverson, thank you very much. That is seriously funny. Why didn't he just turn on the lights? My kids are a bit older but still don't like having their fingernails cut. They will only let Grandaddy cut them! My older son decided at age 9 1/2 he'd take over trimming his own nails. The first time he tried he trimmed nearly his entire toenail off, so now he's elected to put me back in charge. I'm not sure when kids ever take this task over for themselves, but my mom doesn't still cut mine, so I'm assuming it happens eventually. I just love all the science-y and ninja facts. I feel smarter already. And have a strange urge to wear a headlamp hat. Too funny! You have to stay on those nails or they will get to be Baby Scissorhands. I usually grow one leg over them and put a toy in their free hand. Michelle, I might try your distraction technique! Or duct tape. I bet they both work pretty well. Hi Robyn. This was so funny.. I love the connection between spelunking and clipping fingernails. And caves as the nostrils of the earth. Funny.. I think your husband's idea was brilliant. I really enjoyed this. Oh this was so funny. My kids actually cut their own nails now (ages ten and twelve) and it's kind of amazing. But I do remember those baby razors. . .
Oddly enough, while my high school did not have a Spelunking Club, we did have a Baby Fingernail Clipping club. It wasn't very popular. i don't know if it breaks some sort of blogiquette, but i have to say that that comment from christian was pretty funny. Ado, I'm glad you agree - join the movement, we're bringing spelunking back! Just the word though, not the activity. Because, you know, cave spiders. No thanks. Christian, we had one of those, too, but I was banned. I'm not allowed to discuss why. Third Party, I believe you're allowed to comment on comments, plus you get bonus points with me for commenting twice on one post. It shows how attentive you are, without seeming stalkery, because we're married. HAHAHAH great idea dad! My sister has to clip her cats' claws. Not fun. Spelunking is one fabulous word and brings up two others I rarely hear: stalagtites & stalagmites. Can't remember which are which, formations that either drop from the ceiling or raise from the ground in a cave! Damn baby's nails do grow at ridiculously quick rate! That's hilarious! And why didn't I think of this when my light sleepers were babies? It's brilliant! Gia, what IS up with cat's claws? They're the only creatures that hate clipping more than babies, but then you go to all that trouble and still find cat claws littered around sometimes. Look, Cat, if you can just eject the stupid things from the tips of your paws, why do I bother trimming them??? That is hilarious!! Oh my gosh! I love the headlamp. My 6 year old son has nails that grow freakishly fast. I forget about them and then I'm horrified when I see how long they've become, worrying that teachers and parents everywhere are judging me. Oh my goodness...first, I love your dad's comment and then yours back. Second, this made me laugh! This is awesome. Seriously. All of it. oh, this is heavenly, heavenly funny. and totally what i'm going to do next time i need to clip my toddler's fingernails. except i might have to use my husband's old army night vision goggles. because that. is. awesome. 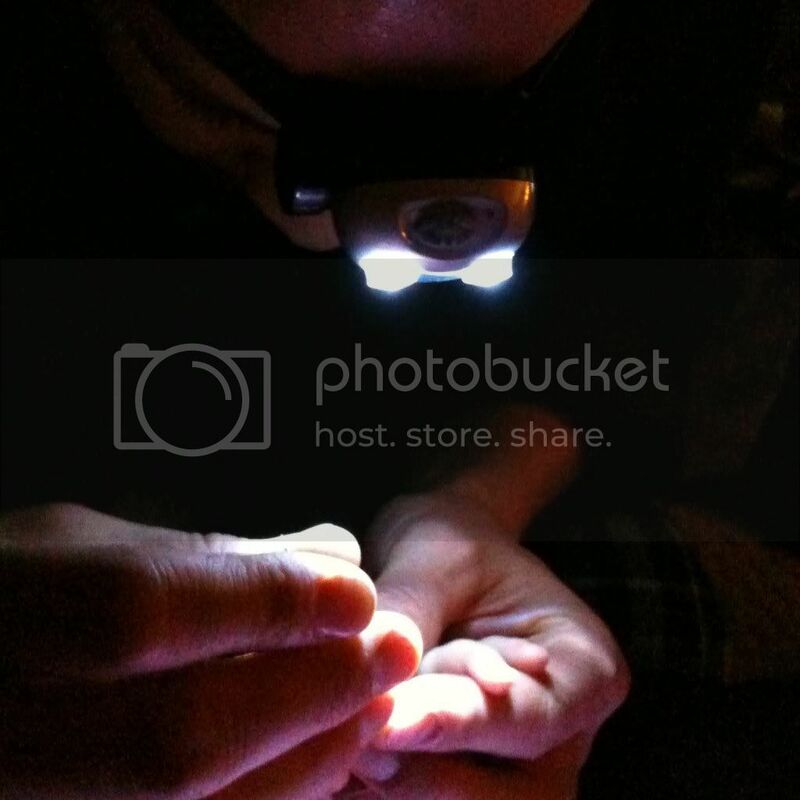 I cut my kids' nails while they slept, and I never thought of getting a headlamp! What a perfect idea. I learned about spelunking in college when a friend asked if I'd come along. No freaking way with my (even mild) claustrophobia. And now I associate spelunking with that scene in Trainspotting where he dives into the toilet to retrieve a pill. Go figure. Is your husband an engineer? My husband would do the exact same thing. I relate it to the fact that he is an engineer. Love it! Susan - night vision goggles?!?? I LOVE IT! Kristin - Ditto on the mild clausterphobia thing. I 100% equate spelunking with getting myself and my bckpack wedged in some teeny crawlspace 50 miles below the surface of the Earth. No thanks. I couldn't say "ditto" on the Trainspotting thing until you mentioned it, but now - ditto. Katie - thank you! I'll tell him you said so - he looooves the word "brilliant" (when used in reference to one of his ideas, anyway). This. is. awesome. Creative parenting solutions at it's best! Oh my LORD I am laughing so hard I almost woke up my 3yo. Who lets me cut her fingernails. Sans headgear. Lucky me! You ARE lucky! My 7yo and 10yo still have to be hog tied and duct taped to the floor if I want to keep their fingernails short enough for them to continue using forks and holding pencils. Hmm, maybe I'm doing it wrong... Isn't your daughter scared when you pull-start your clippers? What, your clippers don't have a gas engine? Well, that could be part of my problem. I have actually spelunked, and it was AWESOME. But never for baby fingernails. I'm the badass who just wrangled awake kids and went for it. Came from Finding the Funny!, where this post totally belonged! I love that picture! Your husband rocks. Came here from Finding the Funny. Thanks for the laugh! This really made me laugh out loud!! Ha!! I love, love that you said they grow 16 acres per second. This was perfect for #findingthefunny!